If you have trouble asking for favors, it could be that your intuition is telling you something important. Sometimes coaches assume that if clients have difficulty asking for what they want, they just need coaching to get over their resistance and learn how to ask. However, in many cases, it's really the client's inner wisdom that's stopping them. The client may indeed need coaching, but coaching the wrong issue is just a waste of time. Here's why. Most people have an inner barometer that tells them where they stand with others. This barometer is either instinctive or intuitive, I'm not sure which, but for our purposes, it doesn't really matter. It's the barometer that holds most people back from asking for, and getting, what they really want. If your inner barometer is holding you back from asking for what you want, what it's telling you is that you haven't been giving enough. If you're someone who gives your time, effort, attention, care, acknowledgment, money or whatever to others on a regular basis, with little concern for how or when it will come back to you, most others will be happy to help you when you need it. If you just give to get, on the other hand, people will avoid you. And if you're someone who rarely gives, most folks will run the other way if you ask them for very much (except, perhaps you nicest relatives). 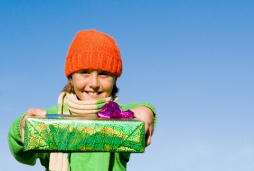 Giving without concern for getting is the surest way to get what you want pretty much all the time. So why don't most people give more? What's this resistance really about? Well, some people unfortunately were brought up around people who don't understand this principle, so they were just never taught, but often there is a fear underlying the failure to give. This fear masquerades as a desire to not be seen as a doormat, or not to be "taken advantage of". Have you ever worried about that? If you're concerned that giving more will cause people to take advantage or perceive you as a doormat, you've got a different kind of a problem. This is a matter of you and your own boundaries, not that other people are out to take advantage. Any time you find yourself worrying that people might take advantage if you offer to do more for them, what you're really worried about is that you won't take care of yourself adequately by identifying what your boundaries are and communicating them. If you do that, few people will ever take advantage of you and those that do will be fairly easy to deal with. It's up to you to say "No" now and then and once you learn how, you're free to give with abandon and thoroughly enjoy it. Not only that, but people who tend to take advantage of others (known as "energy vampires") will naturally give up trying to get more out of you and focus on some other victim. Whereas people who are givers (Read: People who are good at saying "No") will naturally be more attracted to you and they'll be happy to help next time you need some assistance with something. So when that resistance to ask for a favor, or a sale, or even a few moments of someone's time comes up for you, ask yourself what's it's telling you. If you haven't been giving enough, you've got some work to do and the first step is to set some boundaries. To get more of what you want, learn to say, "No". 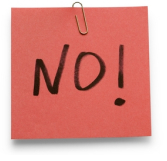 Read tomorrow's blog post for ways to say, "No".